Gymnasium LED Lighting – Sunlite Science and Technology, Inc. 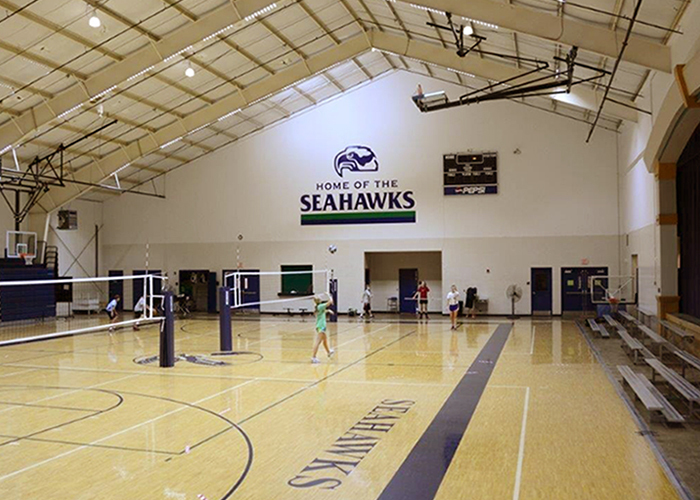 In 2014 Sunlite Science & Technology was pleased to work hand in hand with the Bishop Seabury Academy staff and Del Sol Electric to revolutionize the lighting at the Bishop Seabury Academy gymnasium. Indirect and direct efficient Sunlite LED light fixtures were incorporated into the gym to reduce the total power consumption from over 12,000 watts down to 5,850 watts while increasing the light level on the court by over 200%. The lights are also dimmable. Project Size: 10,925 sq. ft. 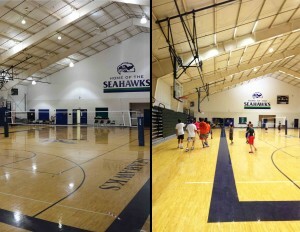 The picture on the left shows before and after lighting of the Bishop Seabury Academy gymnasium in Lawrence, Kansas. As shown in the pictures, LED lighting is fantastic for large, open spaces. It eliminate “hot spots” on the floor.